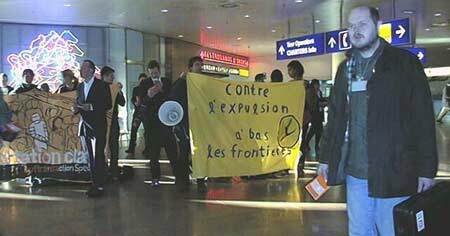 On 15.dec.01 Activists from Belgium, the Netherlands and Germany have protested against the deportation business at the Internatinal Airport of Brussels, Belgium. 15.Dec.01 - Today 'Pilots and Crewmembers against deportations', together with activists from three different countries, have protested against the deportation business of the European Airlines. Armed with banners about 50 activists marched trough the departure area attending bystanders about the practice of deportations on board of regular flights. Among the protestres was a Flight Crew dressed in Lufthansa Uniforms. The activists paid tribute to Amir Ageeb, Kola Bankole, Marcus Omofuma, Samira Adamu and others who have been killed during attempts to deport them.